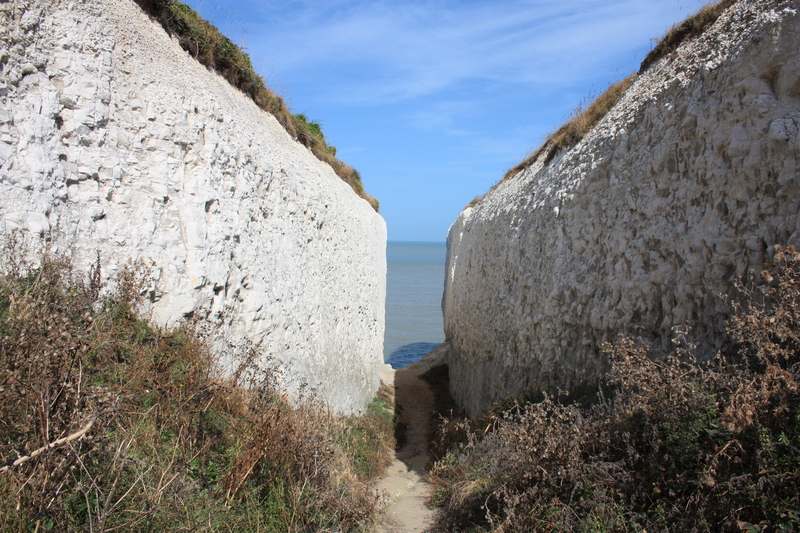 We left Botany Bay with reluctance, setting off through a cutting and taking the cliff-top walk. Here was a momentous occasion for us: we turned a corner. Instead of walking east, which we had been doing for the last seven months, we began to walk south. At the corner was Neptune’s Tower. Neptune’s Tower is the ruin of a folly which was built by Henry Fox, 1st Baron Holland, in the 18th Century. 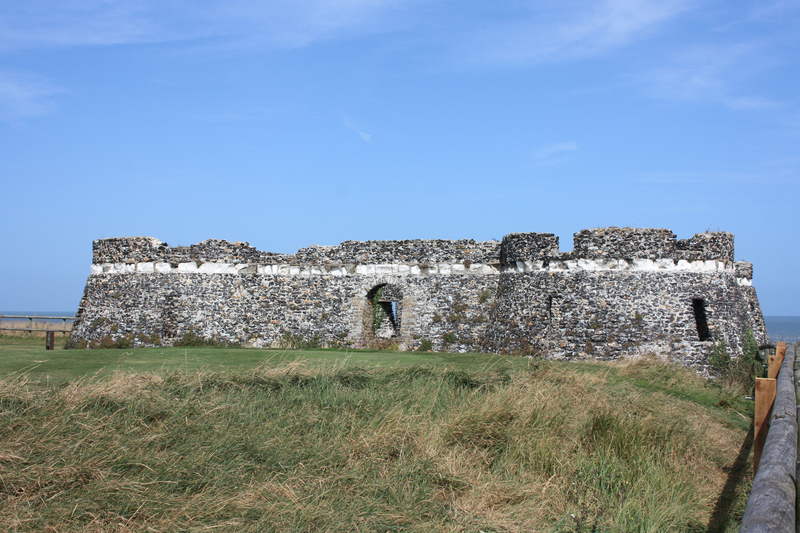 It is one of several follies surrounding his Broadstairs home of Kingsgate Castle. Follies are built primarily for decoration, and extravagant decoration at that. This one had a large central tower, but that no longer exists. 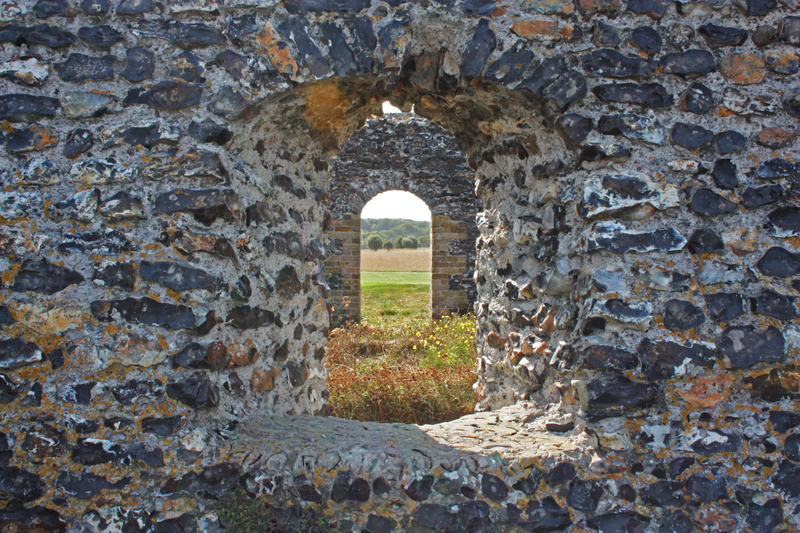 Today it is a rather flat structure, its windows giving an interesting view to North Foreland Golf Course behind. Turning the corner, Kingsgate Castle itself came into view. No longer a residence, it has been converted and is now apartments. 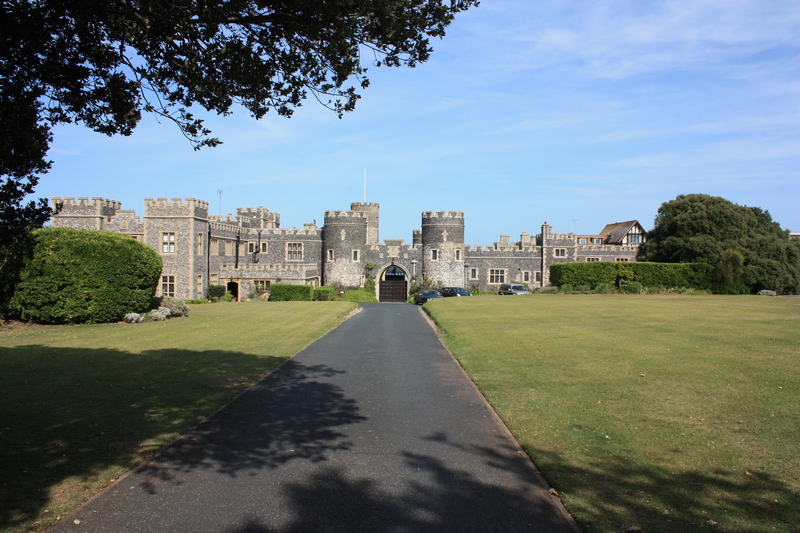 As we walked towards the castle, we passed a small track leading away across a bit of grass. It was so discreet that we missed it at first. This unassuming little path led to a beautiful natural cutting between two cliffs: Whiteness Gap. 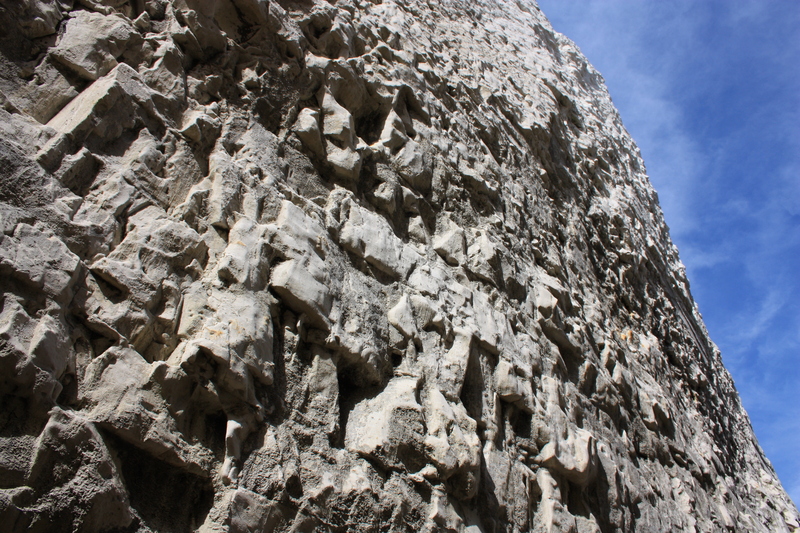 Perhaps 15 feet wide, the cliff walls tower above. Kingsgate Castle is a private estate and there is no coastal path around it. 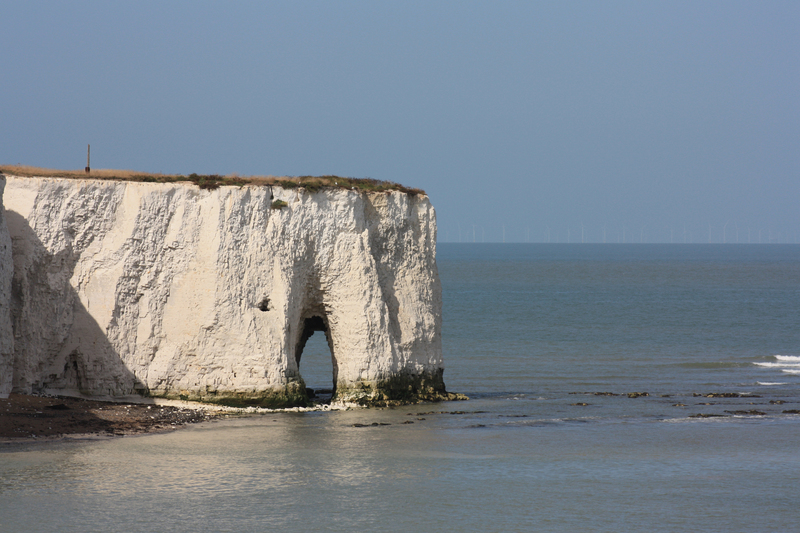 Before we cut inland to circumnavigate, we took one last look back at the cliffs, seeing something we had not realised was there until now: a natural chalk arch. As we walked around the castle we got a good view through the front gates. I wonder how much the service charge is here? 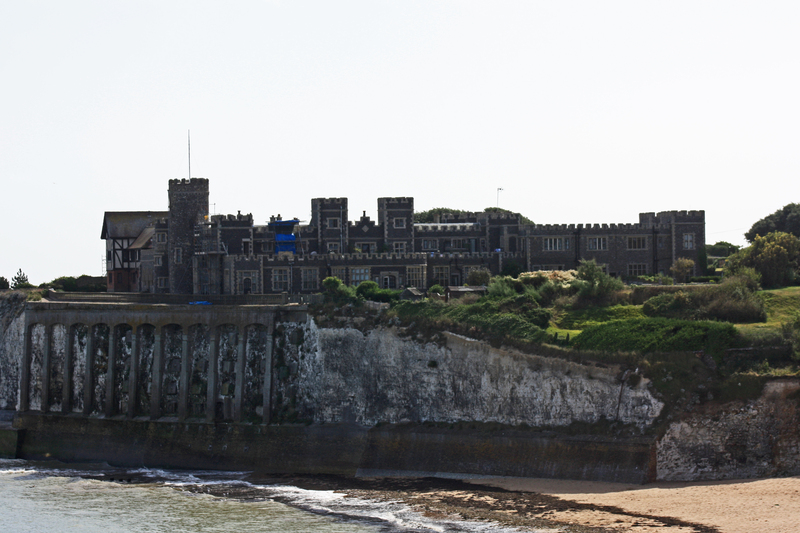 Rounding the castle, we made our way back to the coast at Joss Bay. There was some sort of festival going on there. After such a peaceful morning’s walk none of us felt like the roar of society. 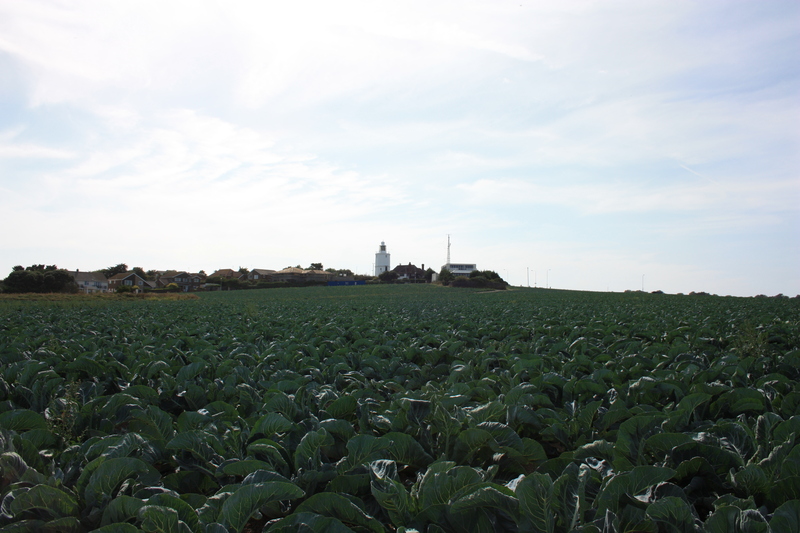 We walked on, opting for a quiet cabbage field instead. North Foreland Lighthouse, built in 1691, was visible in the background. After another cliff top walk through an area of expensive looking houses, we arrived at East Cliff. Beachcombing started in earnest. “Look at this, Dad!” called my son. In his hand was a perfectly round stone. Why I should find this so remarkable I don’t know, but it was mundane and yet so strange in equal measures. 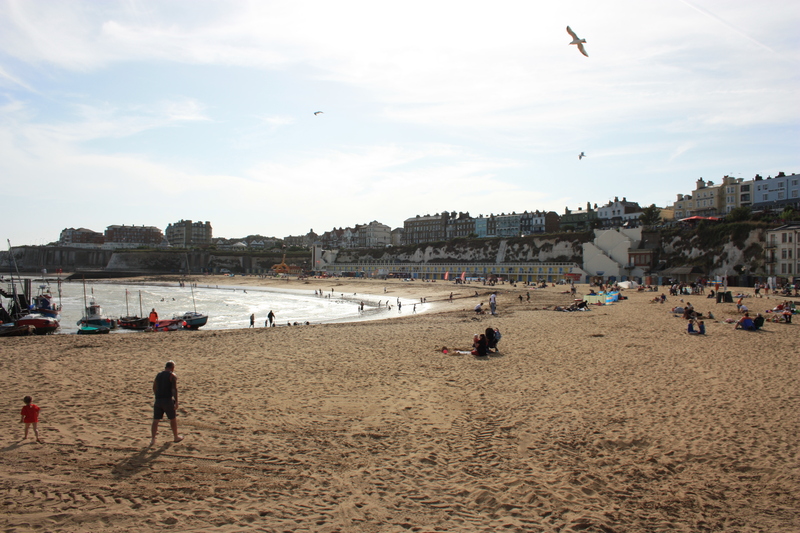 We carried on, the beach becoming more populous as we approached Broadstairs. Bleak House peered over the cliff and looked down at us. 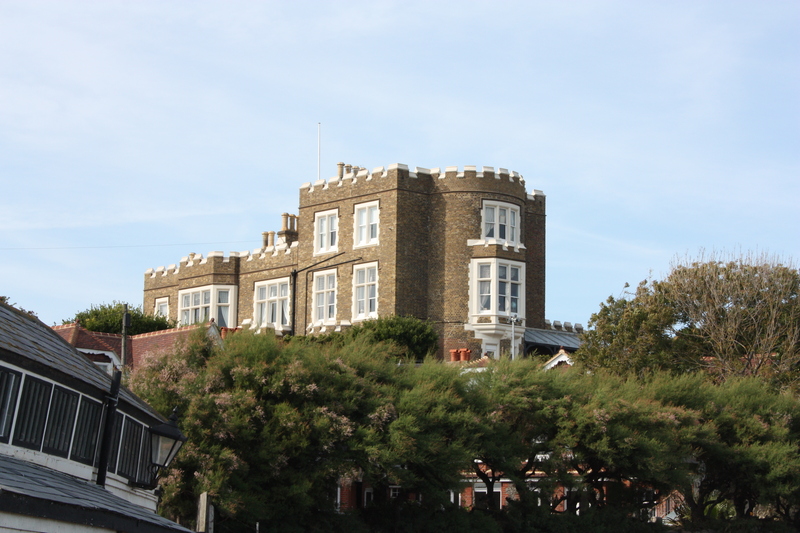 Originally called Fort House, it was here that Charles Dickens used to spend many of his summer months. He wrote David Copperfield here. He also planned his novel Bleak House here, but it was many years after publication that Fort House was renamed Bleak House. We turned the corner into Viking Bay. The main beach of Broadstairs was not packed, but once again it was populous enough for us to want to carry on to a more peaceful stretch. We walked on, and in little less than a mile came to Dumpton Gap, our journey’s end for the day. 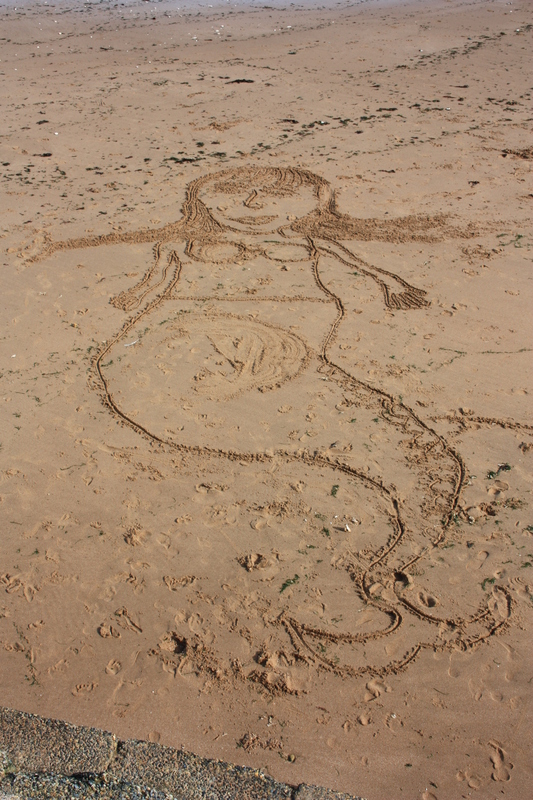 There was an impressive drawing of a mermaid in the sand, although the poor thing had one arm bigger than the other. We drove home. We cleaned the shells our children had collected by boiling them. Our whole house now stinks of boiled seaweed. This entry was posted in Kent and tagged beachcombing, Broadstairs, cliff, coast, folly, Kent, North Foreland, travel, walking, Whiteness. Bookmark the permalink. 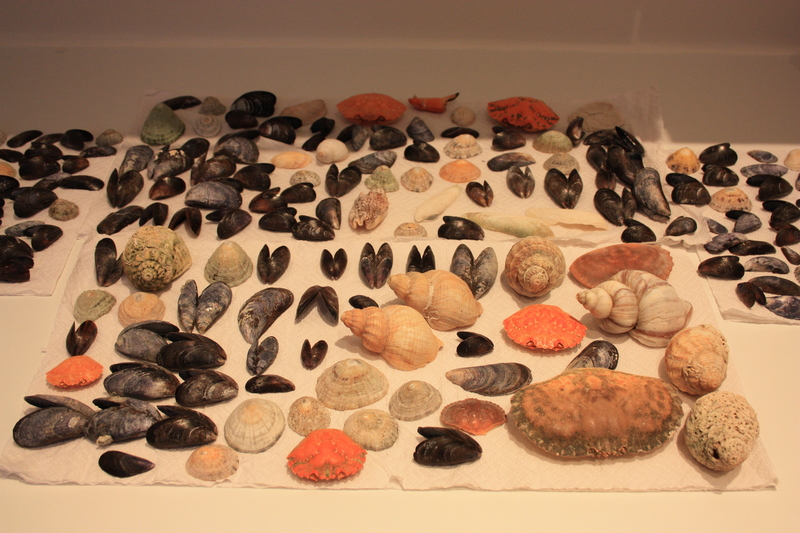 Nice seashell collection! Such a lovely walk. Love the castle – I wouldn’t mind wandering around that place for a day or two! 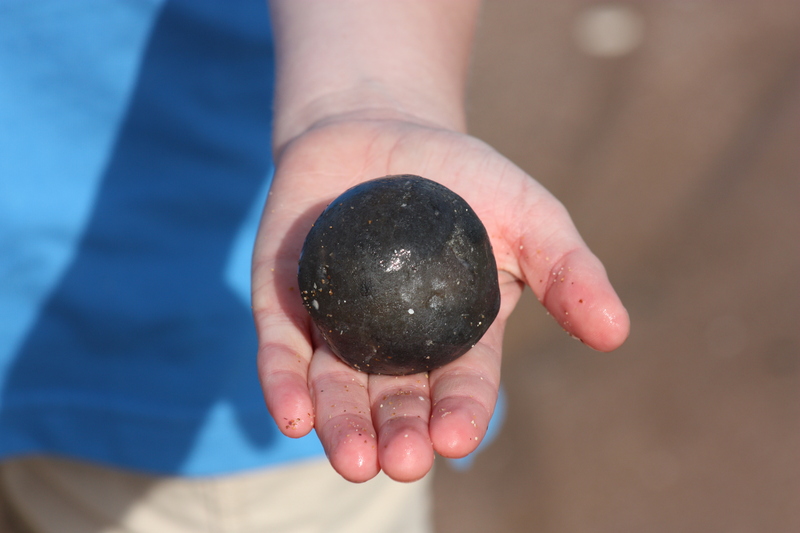 Could your perfectly round stone have been a cannonball? Early cannon shot was made out of stone. That’s great to hear… So where is next on your adventures? I’m sure there would be some great snow-covered coastal paths at present with so much of the UK suffering from heavy snow. Fascinating adventure narrative and many interesting photos.